One of the vessels requisitioned for the attack, the Hind, travels eastwards from Bengal to China, sailing into the midst of the First Opium War. The turbulent voyage brings together a diverse group of travellers, each with their own agenda to pursue. Among them is Kesri Singh, a havildar in the East India Company who leads a company of Indian sepoys; Zachary Reid, an impoverished young sailor searching for his lost love, and Shireen Modi, a determined widow en route to China to reclaim her opium-trader husband's wealth and reputation. Flood of Fire follows a varied cast of characters from India to China, through the outbreak of the First Opium War and China's devastating defeat, to Britain's seizure of Hong Kong. 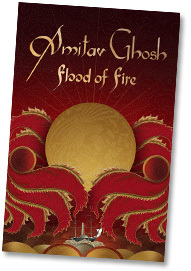 Flood of Fire is a thrillingly realised and richly populated novel, imbued with a wealth of historical detail, suffused with the magic of place and plotted with verve. It is a beautiful novel in its own right, and a compelling conclusion to an epic and sweeping story.